What comes to your mind when you hear the phrase "80's horror movie?" Is it low budget? Is it bloody? Is it a lot of effects held together by a flimsy plot? Or is it innovation? The origins of modern special effects? Highly political works commenting on major issues and trends in society through an absurd escalation of violence and characters representing sides in the conflict? A little bit of everything? 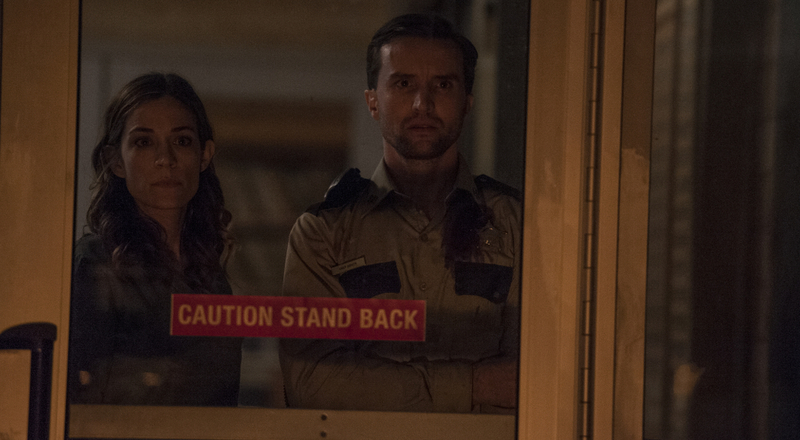 The Void nails the color story of 80s horror. I'm pretty sure everything done in the film--makeup, effects, stunts--could have been accomplished in the 80s, too. That's a compliment. 80s horror has endured because the practical effects looked good in person and onscreen. The actors had a good reason to be afraid. The Void is very much an 80's-inspired horror film. It teeters between the violence of the video nasty era and riffs on John Carpenter's The Thing and James Cameron's Aliens. An unexpected mix of survivors wind up at a soon-to-be-abandoned hospital in the middle of a cult and alien crisis. A group of hooded figures communicating with horns are traveling throughout the countryside and attacking anyone who moves. Inside, an alien force that creates dissociated thoughts within its victims before violently attacking travels from survivor to survivor in the hospital. Can anyone survive attacks from every imaginable angle in a partially burned down hospital? Writer/directors Jeremy Gillespie and Steven Kostanski know how to make a good looking film. They have years of experience working in art direction and special effects makeup, respectively (including work on films as varied as The Shape of Water and Suicide Squad). The Void looks like a high budget horror from the 80s, and that's a tremendous compliment. The trends are spot on--amber and muddy greens to tint the frame day or night, screens filled with more shadows than not to hide secrets, layer upon layer of detail hidden in plain sight within photographs and other props, and abandoned structures that look like a shelf fell over in a home improvement store. The look of the film is a welcome nostalgia trip with modern filmmaking sensibilities. If the pieces don't ever really come together, it's not for a lack of trying. The least developed character in the entire film is the first victim--that shocking death to let you know how bad things will get and set you off guard--and even she gets more backstory through later scenes than most victims in horror films. The Void tries so hard it loses sight of what's actually terrifying. The unifying thread for the characters in the film is children or medicine. The adults in the film have all lost children to tragic events or are the sole survivors of events that killed entire families. In between is a pregnant teenager about to give birth and her supportive grandfather. They're at the hospital, where everyone else is, unsurprisingly, a doctor, nurse, or intern studying medicine. The medicine connections are fine, but the child/birth/death cycle is just a bit too convenient. "Alien" is a loose term here. It doesn't have to be extraterrestrials. It's an outside invasive species with ambiguous origins. Maybe this triangle-faced cult standing menacingly in the woods outside has some idea of where they came from. The Void just leans in too heavily to this concept too soon. The big reveal into the third act could easily have been achieved without having every character who ever lost a child blurt it out with no context or warning for the first third of the film. The pregnant teenager in the middle of a high risk pregnancy is metaphor enough without having to be so literal. It's that 80s excess more prevalent in a slasher series than a true standout of the era taking center stage. Alien/body horror is, at its core, a representation of fears connected to pregnancy and childbirth. We're afraid of what will happen in the future. We worry about the fate of the next generation and losing control. What greater loss of control is there than an alien species using our bodies to advance their own species? The victims literally carry the progeny of the monsters until they are outnumbered and forced to fight for survival. It's a fear of losing control--our bodies and lives changing through the birth of a child, the world changing as new people grow up and assume control, the ever-present threat that your child will be one of the ones who doesn't get to change the world. The fear is what we know being lost to what we could never actually control. The monster/body snatching/alien invasion angle is just an absurd nightmare to play on those themes in a way so removed from reality they ultimately feel safe to watch. The Void uses foreshadowing and suggestive imagery so right quite a few scenes. There is a brilliant, twisted scene when the hospital is introduced that shows how this information can be presented without blurting out that she lost a child or his child was murdered. The intern, bored out of her mind, sits with an attractive patient about her age in the hospital. She's reading chapters from a medical textbook to him, finally getting excited over a graphic explanation of "degloving" injuries. It's a cheap sight gag that winds up being the primary means of identifying who is or is not effected by this otherworldly force in the film. It's an image that gains more and more meaning as the story goes on without constantly saying "oh no, another degloving injury" like they do with the pregnancy/childbirth moments. It's a battle between showing and telling and the film soars when showing is in control. So much of The Void is excellent. The effects, acting, and overall story arc are very well done. The few slip-ups in exposition really stand out and distract from the overall film because so much is so right. The Void is scary, entertaining, and feels quite fresh for leaning so heavily into its 80s influences. Any horror fan who can handle gore will find something to like in The Void. 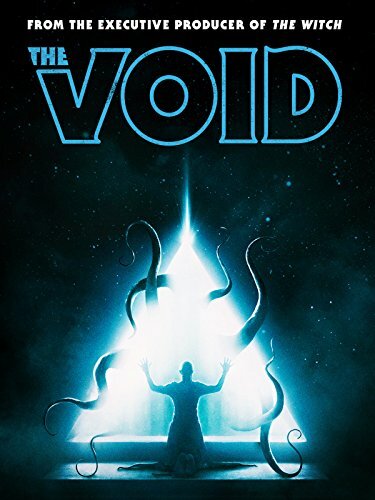 The Void is currently streaming on Netflix.